Working with the Divine Mothers to help soften the world to bring compassion, Love and awareness to all. Aroha brings nourishment through food, water, air and fire into your life. This brings harmony and balance to one’s self. Purifying those who have opened themselves up to spiritual growth, nourishing the body will also nourish the spirit and soul, for more Love and fulfillment. Bless your food as it enters your body, feel your food moving through to your cells and your 12 strands of DNA. Drink water to flush the body and to give clarity to the life force that resides within you. Aroha is working on the 5th Ray with Master Hilarion and all those who reside on the 5th Ray. Heal and be mindful of your being, in order to radiate personal purity for spirit, Now. Green stone will give you a strong hold and awareness for the body. Wear it or meditate with it to bring strength, overcome addictions or if you crave the wrong foods. Connecting to the Love and energy of Aroha made Glenn realize how grateful and thankful he is to be living in New Zealand. 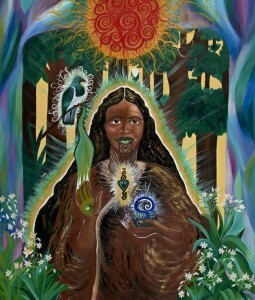 One of his earliest paintings, Glenn connected with Aroha and painted her in 2003.